Special Olympics Thunder Bay provides year-round sports training and athletic competition for individuals with intellectual disabilities. It has been part of our community for over 25 years and currently has more than 100 volunteers providing sports programs for more than 300 athletes in Thunder Bay. Special Olympics Thunder Bay is a part of Special Olympics Ontario which has promoted opportunities for athletes to develop physical fitness, demonstrate courage, experience joy, and develop skills and friendships for more than 40 years. Special Olympics is a charitable, non-profit organization that provides sports training and competition opportunities at regional, provincial, national, and international levels for individuals with an intellectual disability. Its primary objective is to contribute to the physical, social, and psychological development of people with intellectual disabilities through positive, successful experiences in sport. These positive experiences help build self-confidence, self-esteem, pride, and a great sense of accomplishment. Participate in the sport they wish in the community they wish. Enjoy programs every day of the year. Grow physically, emotionally, and socially. Compete locally, provincially, nationally and internationally. The Faye Peterson Transition House (FPTH) provides a safe and supportive temporary shelter environment, crisis services, counselling, Outreach, transitional support, advocacy, early childhood education, and support groups to women, youth and their children. Our Vision Statement: Every Woman, youth and child(ren) live in a safe, inclusive community free of violence, racism and oppression. Women are equal, independent and fully participatory members of society. Our Mission Statement: The Faye Peterson Transition House (FPTH) provides a safe and supportive temporary shelter environment, crisis services, counselling, Outreach, transitional support, advocacy, early childhood education, and support groups to women, youth and their children escaping violence utilizing harm reduction philosophy. The FPTH is a community based, feminist organization which operates within an Anti Racism/Anti Oppression framework. We are committed to social change through public education, policy development and advocacy, to achieve social justice for all women, youth and children by ensuring the system holds perpetrators of violence against women accountable through vigorous prosecution. We believe in women’s rights to self-determination, dignity, respect and personal accountability. Recognizing women’s and children’s needs in crisis, we provide a safe and supportive shelter environment, crisis services, counselling, outreach, advocacy and prevention education to women and their children in Northern Ontario. 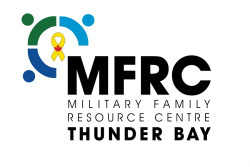 The Thunder Bay Military Family Resource Centre was established in 1999. It is our mission to enhance the quality of life and to enrich the military experience for Canadian Forces families in Thunder Bay, by providing specialized programs and services to promote health, education and social well being. The Canadian Forces recognizes the contributions and sacrifices made by families and the difficulties that Canadian Forces members may face in balancing commitment to country with family life. Make sure you check out their website for the events and fundraisers they have planned for 2014. Now in its 19th year the Fall Charity Classic is an event people look forward to each year. Thanks to the hard work of Wendy and Randy this event has brought in over $100,000 since starting! The day will cost $175/team and is a 4 person best ball tournament, with a minimum of 2 ladies on each team. There is an awards dinner held at the Port Arthur Curling Club where teams have the chance to win amazing prizes! This is the largest food drive that Shelter House hosts each year. From this one day food drive we generally bring about 4 tons of food back for our kitchen. Shelter House Thunder Bay is committed to providing persons with disabilities with equal opportunities and standards of goods and services in accordance with the Accessibility for Ontarians with Disabilities Act, 2005. These goods and services will be provided in a manner that respects dignity, independence, integration and equal opportunity. All Shelter House Thunder Bay buildings are wheelchair accessible and equipped to support clients with most disabilities. Any disruption in service will be posted at the main entrance, on the website and callers will be advised of the disruption when calling Shelter House Thunder Bay. Service animals and support persons are permitted at Shelter House Thunder Bay. Any further accomodation can be discussed with staff. If you would like a copy of our accessibility policy and plan, we will be pleased to provide you with one and/or read it to you. We welcome your feedback! Please contact Crystal DePeuter, Executive Assistant/HR Coordinator at crystal.depeuter@shelterhouse.on.ca or (807)474-4353 with any feedback you may have regarding accessibility at Shelter House Thunder Bay! Regional Food Distribution Association of Northwestern Ontario can use your help! It is more than just a food bank. It is a community kitchen, a warehouse, a meeting place and a learning centre. We promote healthy lifestyles, teach employable skills and foster entreprenuarial spirit. So donate today and help us give people in need a hand.